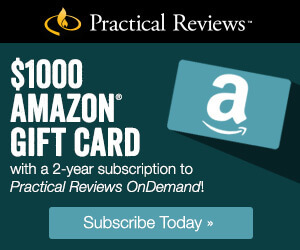 FREE $1000 Amazon Gift Card with your 2 Year Subscription to Practical Reviews. 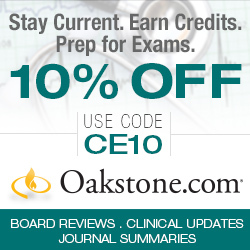 Get 10% Off CMEINFO products at Oakstone.com! *All Coupon Codes and PROMO Codes listed on this page are offered by “CMEInfo," "Audio-Digest," and “PracticalReviews” websites, divisions of Oakstone Medical Publishing and/or Audio-Digest Foundation (a Learner's Digest International business), and all Terms and Conditions as listed on the respective websites apply. There are expiration dates for Coupon Codes and PROMO Codes. NetDoc.com/MomMD.com/StudentDoc.com/DocNeuro.com lists these codes as a service to our users and in no way administers the Coupon Codes, PROMO Codes, and/or related sites which offer them. Enter coupon codes as indicated above on the respective sites. This website is a third party, and these coupon codes are not offered by our website. Please see website(s) at the link(s) above for full details. Exclusions Apply.